The following was originally posted on ilikecomicstoo and has been republished with permission. This is an abbreviated version of the original post; the full version is still available to read here. For the most part, my experiences within the cosplay community have been overwhelmingly positive. Fans and fellow costumers can be wonderfully creative and supportive, and it’s been a pleasure to meet them at conventions around the country. Unfortunately, just like in any community, there exist individuals who can set the hobby back. 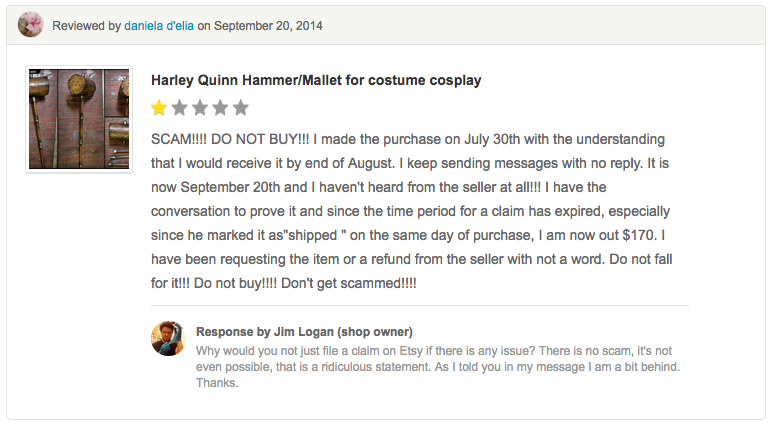 A prop-maker who goes by “Jim Logan” is one of those individuals. Obviously, Jim Logan isn’t his real name—it’s a take on “James Howlett” and “Logan,” aliases of the Wolverine character he enjoys dressing up as. No, no, Jim’s real name is David Eugene Winant Jr., and the reason he doesn’t want you to know that is because, if you look him up, you find this as publicly available information. David was arrested on a charge of theft, which comes as no surprise if you keep reading. See, David, like Wolverine, has a number of aliases—Jim Logan, Snikt Shop, Logan Props, iamyourheroes, Dave Produx, Outlaw Produx or Productions, etc. He keeps changing his name and business title because people keep catching on to his con. So whenever he finds himself in a bind, he erases his existence from the Internet and starts over to prey on cosplay newbies. Classy, right? Well, I was one of the cosplayers he preyed on. Let me preface this by saying: I know I messed up! I broke the golden rule of Internet transactions and failed to adequately research this person before I invested in his product. That’s my bad and I take full responsibility for it. That said, I feel it’s also my responsibility to ensure others avoid enduring the same experience, particularly because his penchant for changing names means he might be hard to keep track of or research in the future. To make a long story short, I paid him $500 up front back in May of this year for a helmet based on the All-New Ghost Rider character from Marvel comics. The plan was to wear it in October for New York Comic Con. I never received the helmet. David/“Jim” was admittedly slow to respond in our limited correspondence, but his work seemed great and he was associated with some pretty big projects and cosplayers, including Project LEX, The Nerdist, Bat in the Sun, Gillykins and Jessica Nigri. In my naïveté, I took this resume as reference enough. He told me to keep my eyes on his Instagram for progress and we were all set. Fast forward four months: I’ve seen no progress photos and begin to grow concerned. So, I shoot him a Facebook message in September… and receive no response. I send another message to the personal e-mail that he himself had provided and… still no response. I message him a third time to his personal Facebook two weeks before the show. Nothing, though he continues to post actively across all social media, make last minute props for his personal friends, make new non-commissioned props to sell on his Etsy and attend events or photoshoots. There are even more examples of this behavior on my website. NYCC came and went and I had no helmet for my costume. On top of it all, I was out $500. And complaints were filed against him with the BBB. There are almost fifty pages of reports in a thread on the Replica Prop Forum. He even scammed Rooster Teeth host Meg Turney. before taking down the entire page. Everything but his personal Facebook account and his Instagram have been either deleted or the page names changed. I have no doubt that he’ll begin anew under a new alias in no time. So, what can you do? Be informed. Do not do business with “Jim Logan” / David Eugene Winant Jr. / Snikt Shop / Logan Props / I Am Your Heroes / Dave Produx / Outlaw Produx or Productions or any other name he cooks up. Avoid my mistake and do your research into anyone you might hire in the cosplay community—Abby Dark-Star has some great advice on how to do that on her page. Never pay the full amount up front. Be safe and spread the word! Marlene, better known by her web moniker “ilikecomicstoo,” is a YouTube Partner and blogger with a penchant for—you guessed it—comics. Her day job involves milling around Tumblr HQ but she wears a number of hats, including editor-in-chief of comics.tumblr and contributor at Newsarama.